North Korean hackers may have stolen a trove of documents from South Korea, including plans to assassinate communist dictator Kim Jong Un. South Korean lawmaker Rhee Cheol-hee, who sits on the defense committee, confirmed the hack to BBC. The hackers stole 235 gigabytes of documents, 80 percent of which are yet to be identified. The documents were stolen from the Defense Ministry’s Integrated Data Centre, BBC reported. The ministry did not confirm the claim. The hack happened in September 2016, but was first confirmed Tuesday. South Korea said in May this year that data was stolen and that it suspected its communist neighbor as the culprit. North Korea denied the claim, saying that South Korea was “fabricating” allegations. The documents included wartime contingency arrangements drawn up by the United States and South Korea, plans for special forces, reports to allies’ senior commanders, and information on South Korea’s key military facilities and power plants. South Korea was subjected to a stream of cyberattacks from North Korea over the past several years, South Korea’s Yonhap news agency reported. The specially trained North Korean hackers are based overseas and in China and tend to attack government websites and military facilities. The hacking revelation comes amid heightened tensions between the reclusive communist regime and the United States. President Donald Trump’s administration spearheaded an effort to impose the toughest United Nations sanctions on North Korea yet in an effort to pressure Pyongyang to abandon its nuclear program. But the communist dictator appears undeterred. 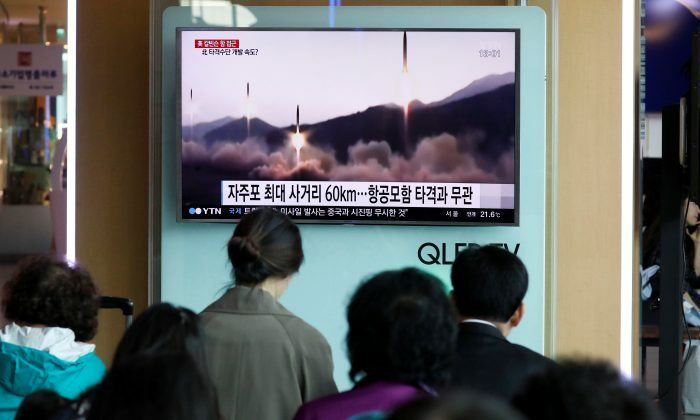 Pyongyang tested a miniaturized hydrogen bomb earlier this year and fired rockets over Japan as it pursues the development of an intercontinental ballistic missile capable of delivering a nuclear warhead to the United States. Trump warned North Korea that the United States was ready to “totally destroy” North Korea should it endanger the United States or its allies. In a follow-up message, Trump hinted to Kim, whom he refers to as “Little Rocket Man,” that agreements and negotiations have done nothing to resolve the conflict and that “only one thing will work.” The White House later clarified that Trump was referring to military action. Trump is a fierce opponent of communism and has often referred to it as a deadly and destructive ideology. North Korea is a typical late-stage communist regime, with millions of people living in terror and the majority of the populace destitute under a corrupt elite class. Hundreds of thousands of innocent people are feared to have perished in the nationwide network of forced labor camps.